Fast-pitch softball is one of the most popular and fastest growing sports among youth females, and the number of high school softball players in the U.S. is nearing that of baseball. But there is one major difference between the two sports: the mechanics of pitching a baseball and the impact it has on the body have been thoroughly studied, but research on the mechanics of the windmill pitch in softball is lacking. While it was once believed that the stress placed on the shoulder in softball is less than in baseball, recent studies have suggested that it may be more similar. The number of injuries in fast-pitch softball is also very high, but the details surrounding these injuries are poorly documented. But despite all these signs that the windmill pitching motion in softball is not as safe as previously thought, there are no pitching limitations in fast-pitch softball as there are in baseball. This means that some softball pitchers can pitch multiple games in a single day, up to three days in a row in some cases. Since research is lacking on the impact of pitching so frequently on these young pitchers' arms, a study was conducted that investigated this effect on strength, fatigue and pain related to windmill pitching in youth softball. 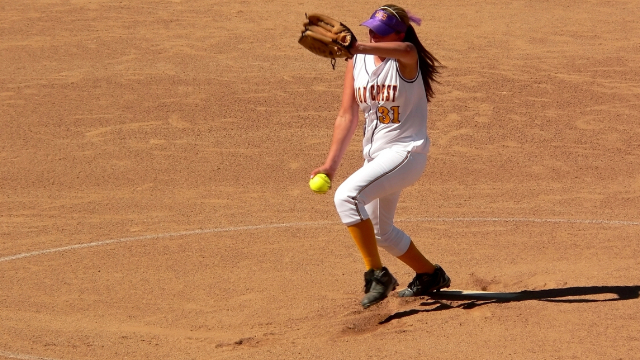 For the study, researchers collected data on 17 female fast-pitch softball pitchers between the ages of 14-18 years who were participating in 2-day and 3-day weekend tournaments. Before pitching, information was gathered on these participants' demographics and their history of shoulder injury or pain, as well as any other medical problems that might have had an effect on their ability to pitch. Then, at the start and end of each day of tournament play, these pitchers were assessed for fatigue, pain and strength of the shoulder and elbow in the dominant throwing arm. These values were compared at the end of each day and at the end of the tournament to determine if pitching had a negative effect on their symptoms.